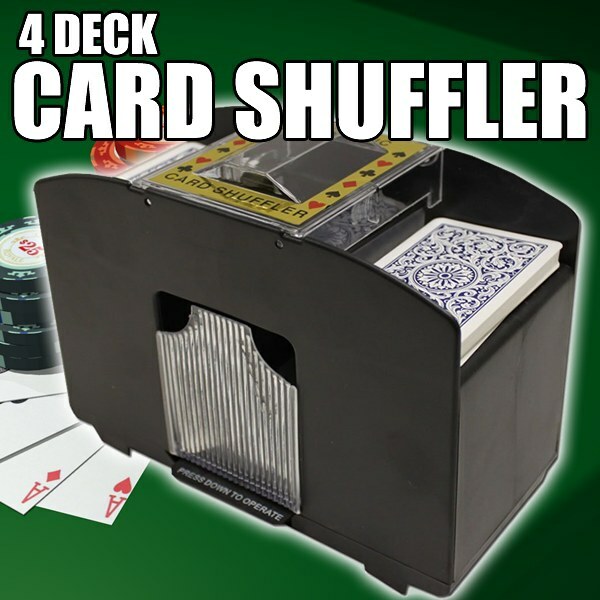 Shuffle up to four decks of cards with the push of a button! Deluxe 4 Deck Card Shuffler Tired of fumbling with a deck of cards? Here&apos;s an easy way to eliminate the dropped cards and sore fingers! Shuffles cards quickly and thoroughly, so you don&apos;t have to. Automatically shuffles 1-4 decks. Fingertip control for quick and easy shuffling. Requires 4 AA batteries (not included). Ideal for Poker, Rummy, Canasta, Pinochle, Blackjack and War. Includes 1 deck of premium quality cards free.